Sultan Abdullah Sultan Ahmad Shah has been crowned Malaysia‘s 16th king under the country’s unique system of monarchy. The 59-year-old, who wore a traditional outfit in pale blue for the ceremony, took the oath of office at the National Palace in Kuala Lumput on Thursday, nearly a month after the sudden decision of his predecessor, Sultan Muhammad V, to step down. He was accompanied by his wife, Tunku Azizah Aminah Maimunah. 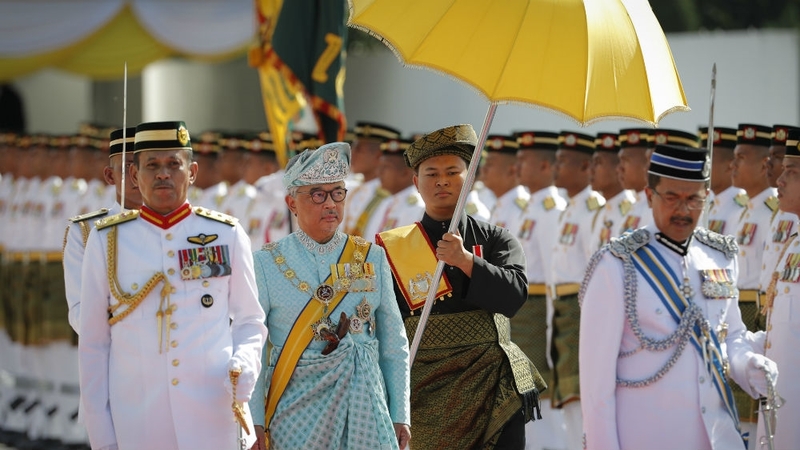 Malaysia’s nine royal households take turns to serve as king, or Yang di-Pertuan Agong, for five years each as part of a system that was agreed in 1957, when what was then Malaya got independence from the British. Sultan Abdullah, who is from the central state of Pahang, takes the throne as the government of Mahathir Mohamad which won power in May moves to introduce wide-ranging institutional reforms. The king is head of the state and commander of the armed forces and also oversees key appointments. Mahathir, government ministers and members of parliament welcomed the new king at the parliament building ahead of the coronation. The king inspected the guard of honour and was given a 21-gun salute. Sultan Muhammad V, 49, resigned abruptly on January 6 after only two years on the throne; the first time a king has stepped down. The palace gave no reason for the decision. The new king is a keen polo player with a passion for football and is a member of the executive committee of the world football governing body FIFA.